What Makes Adirondack Bears So Brainy? There has been a great deal of chatter recently about a smarter-than-the-average bear who lives in the Adirondacks. From the Today Show to small town newspapers, the media attention around our local rocket scientist, Yellow-Yellow, has been overwhelming. Even the illustrious New York Times, publisher of famous Nobel Laureates, is interested in our girl. When something out there garners so much national media coverage, I usually start paying attention. (Did I hear something about Michael Jackson recently?) So this Yellow-Yellow story got me thinking. What could possibly be making our bears so smart? What is it that makes them smarter than the average bear? Clearly, it must be something stored in those alluring Bear Vaults! 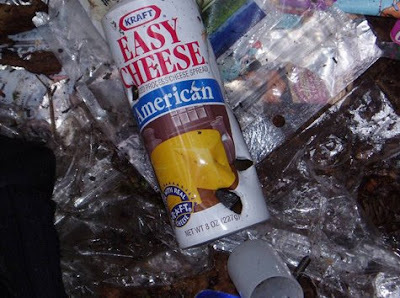 Today's featured photo shows the secret Adirondack bear brain food, complete with tell-tale tooth marks.